Cover image: Chris Ofili, Afro Lunar Lovers (detail), 2003 - Produced on the occasion of the exhibition within reach at the 50th Venice Biennale p.6. Back cover: Afro Lunar Lovers, 2003. 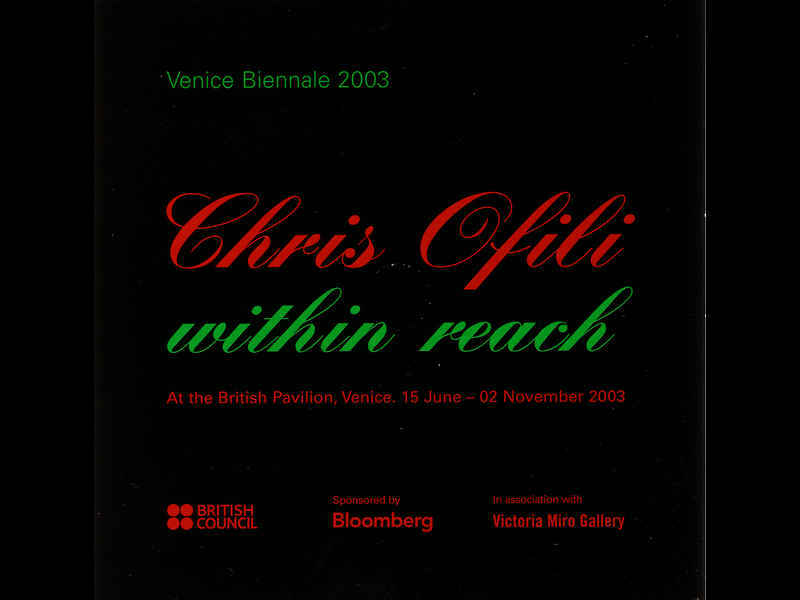 Catalogue produced by the British Council around programming of arts outside of the UK, the main focus being the 50th Venice Biennale, featuring the work of Chris Ofili. Artist Steve McQueen was selected to represent Britain in the British Pavilion at the 53rd Venice Biennale, which took place 7 June – 22 November 2009. Several partners supported McQueen’s contribution, namely, Thomas Dane Gallery, London; Marian Goodman Gallery, New York and the Art Fund Outset Production Fund Partners. McQueen’s contribution was characteristically original and took the form of a film, given the title of ‘Giardini’. The film took its name from the ‘Giardini Pubblici’, the gardens located in the Castello region in the eastern part of Venice. ‘Giardini Pubblici’ is the name of the gardens in which the main pavilions of the Venice Biennale have, since 1895, been located. ‘Giardini’ took the form of a split screen film that documented the area of ‘Giardini Pubblici’, out of season as it were, in ways not normally considered or comprehended by the legions visiting the Biennale every other year. In McQueen’s film, feral dogs wandered, and shadowy figures lurked or engaged with each other in the hidden, less visible environs of ‘Giardini Pubblici’. This film presented a decidedly different view of gardens and buildings that are, during the time of the Biennale, pristine, manicured, and sanitised of the dubious or uncertain elements that characterized McQueen’s film. ‘Giardini’ presented an underside of the venue in which the Biennale is located, and in so doing, obliged its viewers to consider wider matters of visibility, abandonment, and the consequences and implications of a space that has in effect been reclaimed by an imprecise cast of characters. In some respects, ‘Giardini’ presented a counter view of the Biennale, in which ‘Giardini Pubblici’ was not so much empty, but more reclaimed, with the art world’s attention having moved on – for eighteen months or so – to shinier, more spruce, more socially disinfected spaces and locations. ‘Giardini’ was an understated, profound work, which drew much in the way of critical acclaim. It was a triumphant contribution by an artist whose trajectory since the first ICA Futures Award in 1996 had been onwards and upwards, including winning the Turner Prize in 1999 and receiving an OBE in 2002. Steve McQueen was the second Black British-born artist to represent Britain at Venice. 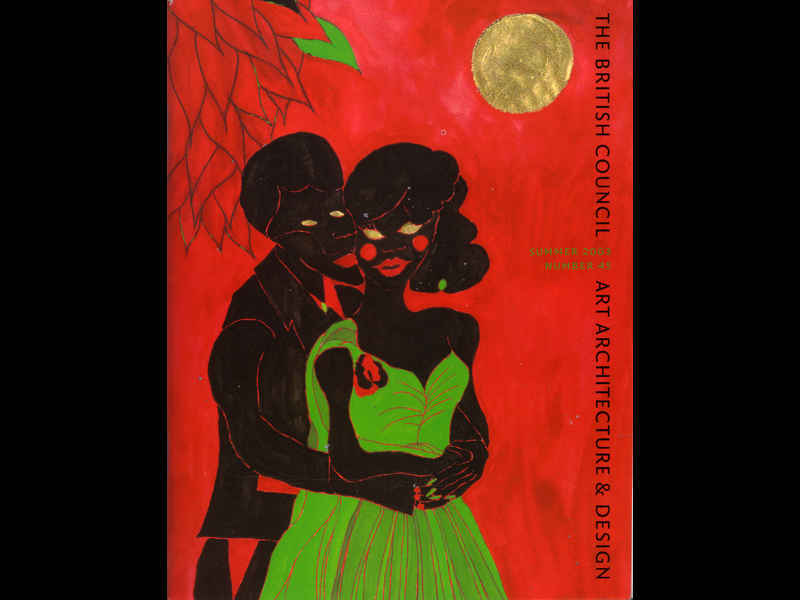 The first Black British-born artist to win the Turner Prize was Chris Ofili. 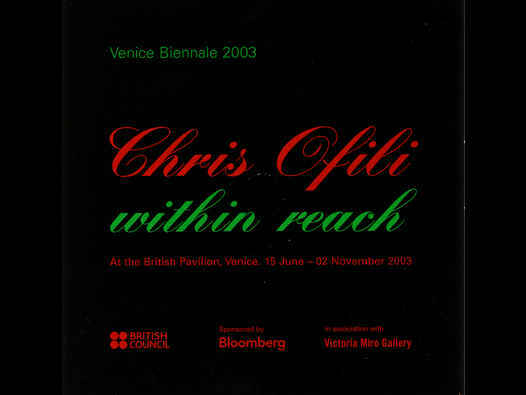 He too had gone on to represent Britain, at the Venice Biennale, in 2003. 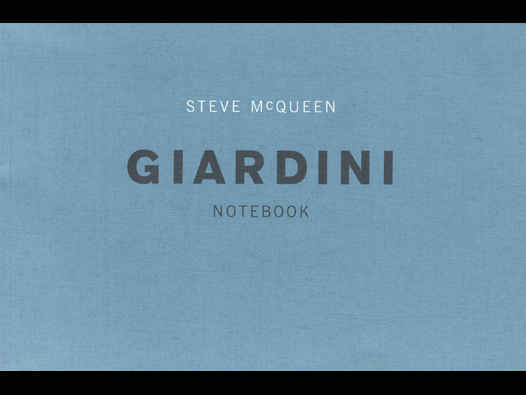 A publication, Steve McQueen: Giardini notebook commemorated Britain’s Venice Biennale contribution of 2009. It included a text by T. J. Demos, “Giardini: A Fairytale,” reprinted as ”Giardini: A Fairytale” in Nka Journal of Contemporary Art, Number 27, 2010: 6-13. Giardini (when shown at Marian Goodman Gallery, New York) was reviewed by Vanessa Rocco, in Nka Journal of African Art, Number 27, 2010: 118-119. 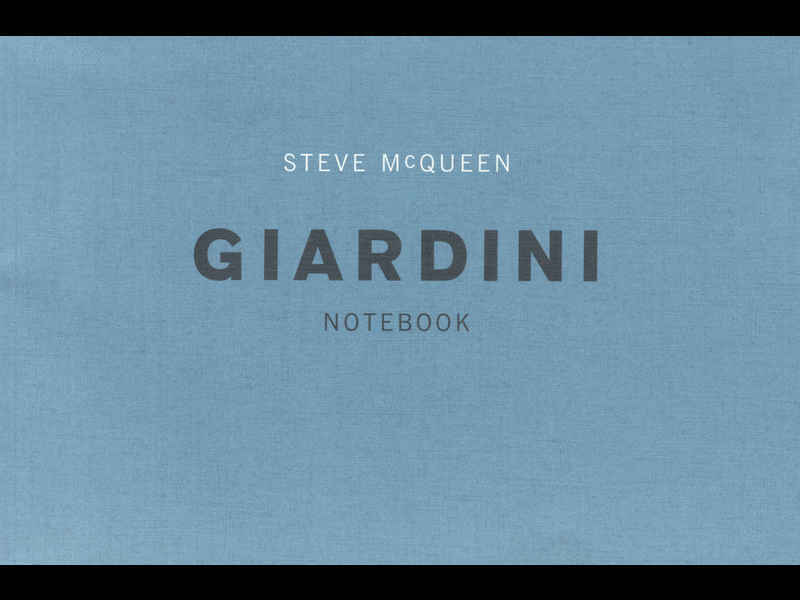 Publication, ‘Steve McQueen: Giardini notebook’ which commemorated Britain’s Venice Biennale contribution of 2009. Artist Steve McQueen was selected to represent Britain in the British Pavilion at the 53rd Venice Biennale, which took place 7 June – 22 November 2009. Several partners supported McQueen’s contribution, namely, Thomas Dane Gallery, London; Marian Goodman Gallery, New York and the Art Fund Outset Production Fund Partners. McQueen’s contribution was characteristically original and took the form of a film, given the title of ‘Giardini’. The film took its name from the ‘Giardini Pubblici’, the gardens located in the Castello region in the eastern part of Venice. ‘Giardini Pubblici’ is the name of the gardens in which the main pavilions of the Venice Biennale have, since 1895, been located. “A visually sumptuous film of thirty minutes, Giardini comprises two side-by-side projections that steadily present a series of evocative vignettes. Rainwater splashes out a quickening rhythm on the hard surfaces of gray and black stones; the blurred shapes of dogs move about restlessly, as if searching for food amid heaps of refuse on an otherwise grand promenade; the dark silhouette of an orderly row of trees creates abstract patterns against a blue crepuscular sky; a young man, seemingly anxious, with darting eyes, smokes in the shadows. With alternating bluish black and warm reddish tones, powerfully and suggestively imagistic, this film radiates a magical aura, one teeming with possibility rather than defined by a single narrative or by the clarity and authority of documentary information. Like McQueen’s past films, such as Caribs’ Leap/Western Deep (2002) and Gravesend (2007), Giardini denies clear links between representation and significance, between form and content—not to exclude reference but instead to allow the image’s potential meanings to crystallize, its facets reflecting numerous paths of fabulation. Indeed, the film’s suspension of its images in a field of multiple possibilities defines its power: to release life from belonging to any certain code, clear narrative, or restrictive regimen, and to do so in the quintessential location of national order: the Giardini of the Venice Biennale. As its title indicates, the film is set in the famous exhibition grounds, the location of the aging national pavilions—the American, Italian, Swiss, and Israeli are among those shown. These otherwise well-known monuments are portrayed here in an unexpected light, during the interim between biennales, in the down-time and during the nights, in the shadows of the spectacle. The renowned gardens are thereby recast as a site where everything is suddenly up for grabs and seems unfamiliar and unpredictable, where life is shown to assume forms of creative survival that transcend the fanfare of the great exhibition. Few visitors, if any, experience it as such. In this sense, the film is attached to Venice’s Giardini only for convenience, and, indeed, its grounds are transported elsewhere by McQueen.